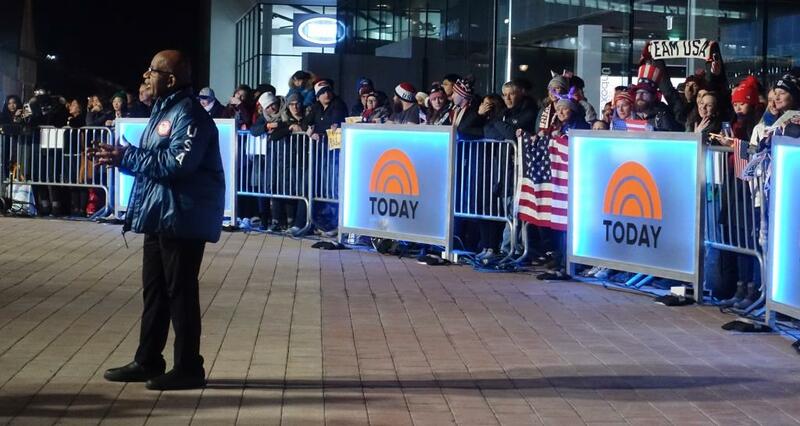 If you're an American at the Olympics, you might as well be leaving your patriotism at passport control if you don't make it at least once to the NBC TODAY Show set in Olympic Park. Been there, done that in Atlanta, Athens, Torino (they brought Al Roker to my P.R. client's B.C. Canada Place log cabin pavilion), Beijing (we took client, the Premiere of British Columbia, to sit with Matt Lauer), London and Sochi. Wednesday night (Tuesday morning stateside) brought the first opportunity to check this five-ringed ritual off the list, and it turned out to be an exciting night to be there! I stuck around for the first hour of the show with about 200 fellow Team USA fans and a few curious South Koreans. 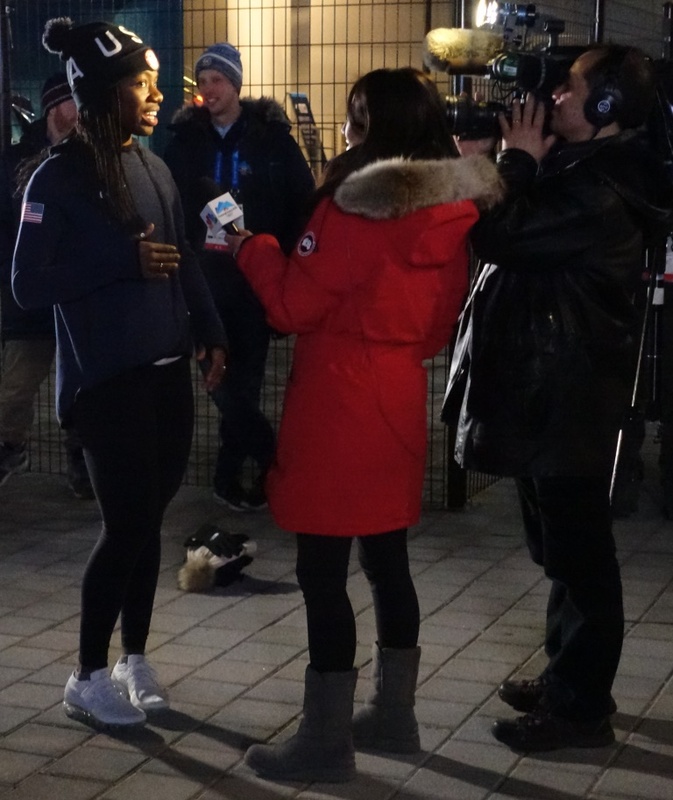 Behind the scenes, members of the U.S. Freestyle Ski Team awaited their national TV spotlight and conversation with Al Roker to preview their competitions. 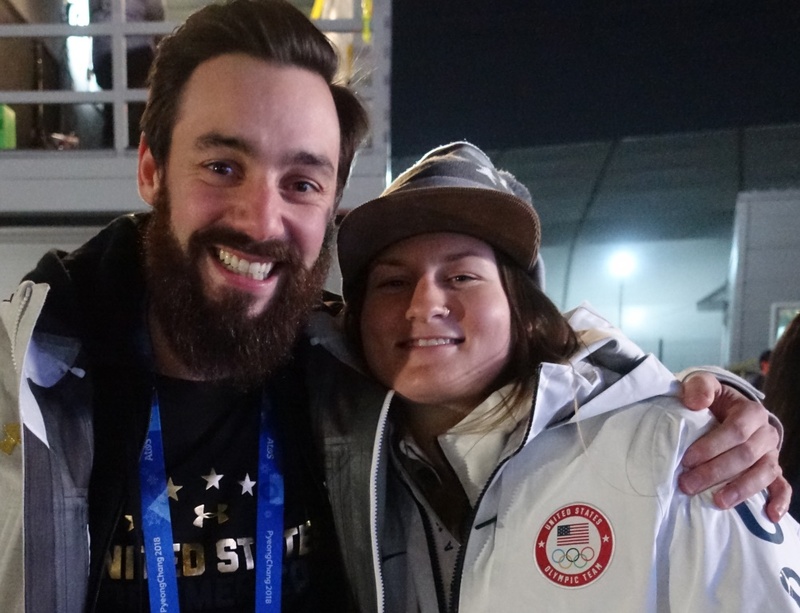 Cute to see Olympic silver medalist Devin Logan meet briefly with her boyfriend. 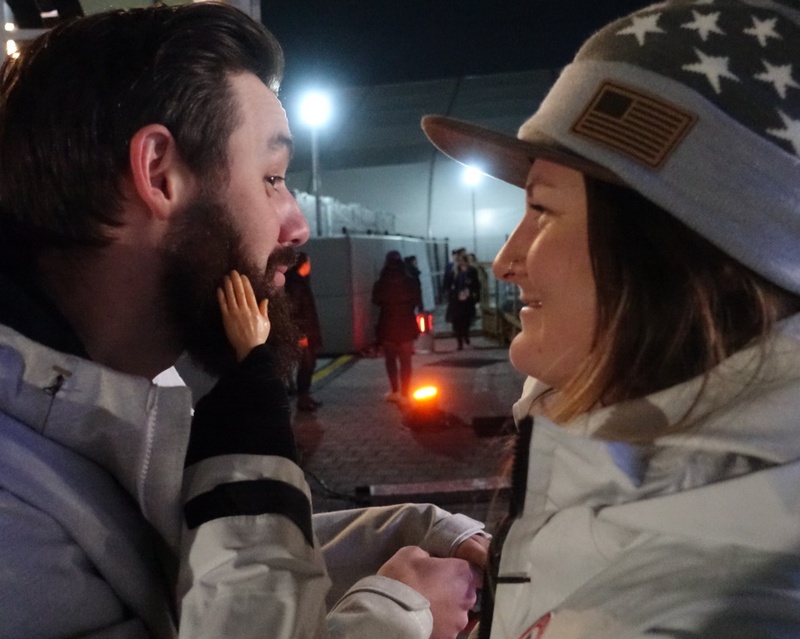 Gotta hand it to her for gently stroking his beard with her Trump-size pretend mitts! Roker's main updates were about the strong winds that temporarily shut down much of Olympic Park. Other news du jour concerned four-time Olympian, three-time medalist and No. 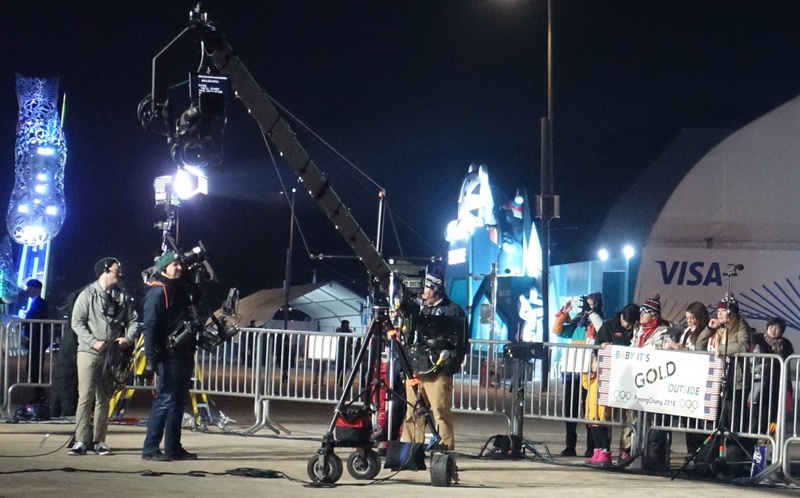 100 U.S. Winter Olympic medalist Shaun White's triumphant return to the gold medal podium. White, who earlier in the day got flustered when reporters asked about past #MeToo-relevant choices, took time to apologize in his TODAY interview that focused mostly on his big day in competition. 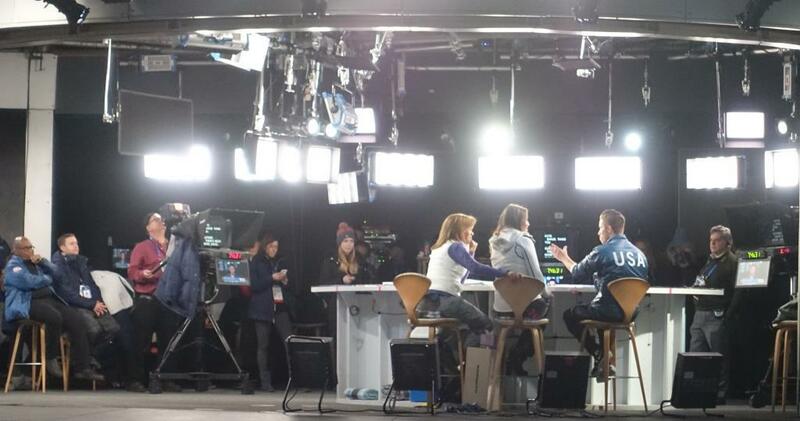 White addressed questions from co-hosts Koda Kotb and Savannah Guthrie. "I've grown as a person over the years and it's amazing how life works, and twists and turns and lessons learned," said White. "Every experience in my life I feel like it's taught me a lesson and I definitely feel like I'm a much more changed person than I was when I was younger." Way to stay on P.R. message. I was delighted when Kotb later worked the crowd and responded to my offer of an Olympic blog pin, which she complimented while posing for selfies. We had previously talked hours before the 2016 Olympic opening ceremony (in front of the Rio Marriott) and, as always, she was all smiles and so friendly to each of the fans on site. 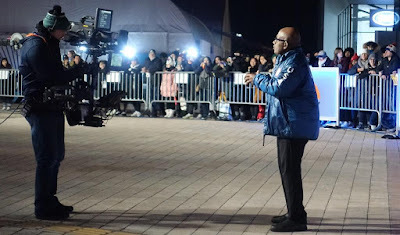 Not sure when there might be another late night at Olympic Park (the live broadcasts to the States start at 9 p.m. in Korea), but it will be fun to discover TODAY sets in Tokyo 2020, Beijing 2022 and beyond.